Tripp Lite's 10 M USB 3.0 active extension cable is a bus powered extension cable that can be used to increase the length of a device cable without the worry of signal loss and potential performance problems. Increase the extension distance to 20 m by connecting two U330-10M together. 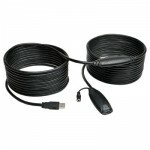 USB limits a cable's length to 4.88 m. Any length above 4.88 m requires the use of an active cable such as this one. This cable has a signal booster built in. The cable must be plugged directly into a USB port (either on the PC or a hub). Use a standard 1.83 m, 3.05 m, 4.57 m USB 3.0 A-B cable to reach the desired distance. The U330-10M provides up to 120mA of power to the connected device. If your device requires more than 120mA of power, an external power supply will be required. The U330-10M accepts a 5V, 2A power supply with a 3.5 x 1.35mm DC jack. The output plug on the power supply should have a positive tip and a negative sleeve. â— Provides up to 120mA of power to the connected device. If your device requires more than 120mA of power, an external power supply will be required. â— Accepts a 5V, 2A power supply with a 3.5 x 1.35mm DC jack. The output plug on the power supply should have a positive tip and a negative sleeve. â— A USB 3.0 Computer port and USB 3.0 device are required to meet USB 3.0 speeds. A USB 2.0 port or device can be used, but you will be limited to the speeds of that port / device. â— The U330-10M provides up to 120mA of power to the connected device. If your device requires more than 120mA of power, an external power supply will be required. The U330-10M accepts a 5V, 2A power supply with a 3.5 x 1.35mm DC jack. The output plug on the power supply should have a positive tip and a negative sleeve.